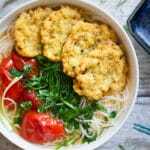 Fried fish noodle soup (bun ca) is another delicious noodle soup in Vietnam that is not well-known abroad, just like bun thang (Vietnamese vermicelli noodle soup with chicken, eggs and pork). It is a favorite dish of many people in the North of Vietnam, particularly in my hometown which is only 20 minutes away from the sea. 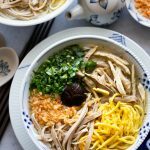 We often eat bun ca noodle soup for breakfast or lunch all year round, but when this noodle dish really shines is right after Tet holiday (Lunar New Year). Tet is the most important celebration in Vietnamese culture, and every family is full of holiday food with a lot of heavy and meaty dishes, such as banh chung (square sticky rice cake). As a result, we get tired of eating meat when the holiday ends and really appreciate a hot bowl of noodle soup with delicate, slightly sweet and sour broth made from fish bones and crispy fried fish toppings. The broth for bun ca is made from simmering fish scraps (bones or heads) of mild and white-fleshed fish. It is light, delicate and not overly fishy though you can still smell and taste the flavors of the sea. We can achieve this by rubbing the fish bones with salt and then rinsing them under water before simmering. After the simmering stage, tomatoes are added to add some acidity and sweetness to the broth and increase the umami of the dish. If you are unable to get fish bones, it’s fine to use pork bone stock in this fried fish noodle soup. 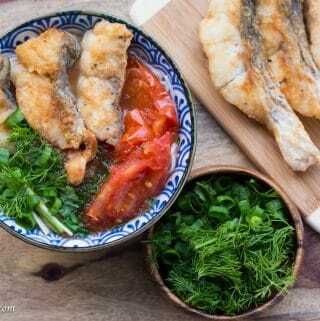 However, I strongly recommend you to try the tomato dashi broth in my Fried fish cake noodle soup in tomato dashi broth recipe. It only requires kombu (kelp), katsuobushi (bonito flakes – shavings of dried, smoked skipjack tuna) and tomatoes. Kombu and katsuobushi are widely available at Asian grocery stores. Making dashi is simple and hassle-free, compared to simmering fish bones. Therefore, using dashi to make the broth reduces cooking time while the resulting clear broth also tastes as good as using fish bones. 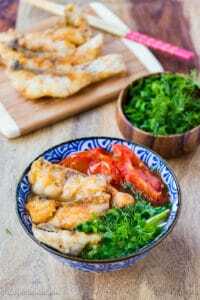 For the toppings, fish fillets are cut into thin slices, and either lightly fried or deep fried, depending on how crispy you want them to be. You can use any fish fillets that can hold up well when fried. 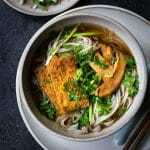 I have tried walleye and barramundi, and both work well in this noodle soup. At home, my mom usually uses grouper or barramundi fillets for this dish. Barramundi is a popular fish in Vietnam, and we call it “Vietnamese sea bass” (ca vuoc). In the U.S., it seems to be lesser known and my fishmonger only has it once in a while. Another important component of this noodle soup is dill. Its aroma complements both the broth and the fish really well. When eating bun ca, you can also squeeze some fresh lime juice and/or add a few slices of bird’s-eye chili to your bowl. 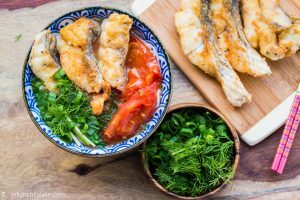 Vietnamese fried fish noodle soup is a delicious dish with light and delicate broth, and crispy fried fish toppings. You won't get tired of eating it. Rub the fish bones generously with salt and rinse well under cold water. 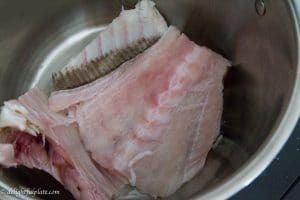 Add fish bones to a pot and fill with 3 - 4 cups of water. I suggest you use the minimum amount of water to just barely cover the bones to avoid diluting the broth too much. You can always adjust the broth with more water later. Add 1/2 teaspoon salt and the small piece of ginger to the pot and bring it to a boil. Skim off any foams/scums. When the water starts to boil, reduce heat to low and simmer for 30 - 40 minutes. Slice the fish fillet on an angle to thin slices (about 0.25'' - 0.4''), season to taste with salt and pepper. After the fish bones have been simmered for 30 - 40 minutes, taste the broth and if you are happy with the flavors, you can discard the bones. Add fish sauce and tomato wedges to the broth. Prepare dried vermicelli noodles according to instructions. Lightly dust the fish slices with all purpose flour. Heat a frying pan over medium high heat, when it's hot, add oil and start frying the fish slices until they are cooked through and crispy. Taste the broth one more time and adjust with fish sauce/water as needed before putting everything together. 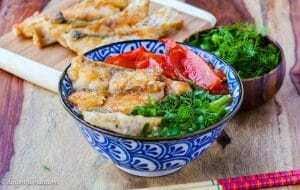 In a serving bowl, add noodles, top with fried fish slices and herbs. Ladle the hot soup over the noodles and enjoy. You may squeeze some fresh lime juice and/or add a few slices of bird's-eye chili to your bowl.